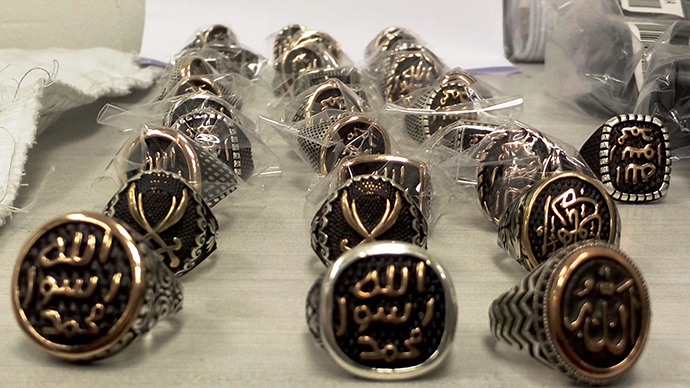 Israeli customs officials have confiscated a package with at least 120 rings, claiming the inscriptions in Arabic the jewelry bears are promoting Islamic State (formerly ISIS/ISIL). Staff at Israel's Ben Gurion Airport intercepted a "delivery of 120 rings bearing an insignia associated with the Daesh [the Arabic acronym for Islamic State] terrorist organization," the Israel Tax Authority said in a statement. The items of jewelry, inscribed with messages in Arabic, were confiscated two weeks ago while being shipped to Ramallah. Some of the rings appear to have only the word “Allah” written on them. Many have a sign known as the Seal of Mohammed engraved on top. Islamic State militants use the Seal of Mohammed on their group’s flag and as a part of their own seal. The silver rings were reportedly produced in Turkey and sent in response to an order placed by an importer in the West Bank. The package containing them was deemed suspicious upon its arrival in Israel. “Everything that comes for the Palestinian Authority is put through a security check,” a customs official told the Ynet news outlet. The rings, found among several hundred other jewelry items, are considered “banned propaganda” in Israel and have therefore been scheduled for destruction. “Although the importer declared the items as rings, it's considered to be incitement,” the customs employee said, explaining the decision to ban the items.